Shoot Magazine Corporation is pleased to announce that True West magazine has agreed to honor SHOOT! Magazine’s current subscribers. True West Magazine will provide a copy of True West magazine to each of SHOOT! Magazine’s current subscribers. 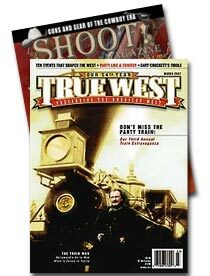 Each subscriber will receive the same number of issues of True West magazine that they should have received from SHOOT! Magazine. True West is not responsible for any refunds. Their only responsibility is to provide you, the SHOOT! Magazine subscriber, True West magazine. True West has agreed to add the number of issues due any of SHOOT! Magazine subscribers to the current issues due any True West subscriber if the SHOOT! Magazine subscriber is also a True West subscriber as of the date of our agreement. SHOOT! Hats off to the folks at SHOOT for negotiating True West subscriptions. Job well done by a team that will be sorely missed. I hope that True West picks up some of the opportunities here to pick up some gun/shooting related items of interest to the CAS folks. I knew I shoulda subscribed to True West already. True West has shown the spirit of the game, therefore, I’m sending in my subscription to True West today. Thanks to both Chucky @ Shoot! and the folks at True West. I have read and enjoyed both Shoot! and True West for a couple of years but only subscribed to Shoot! I haven’t always found True West at my local magazine outlet but look forward to getting it (and re-upping when time comes.